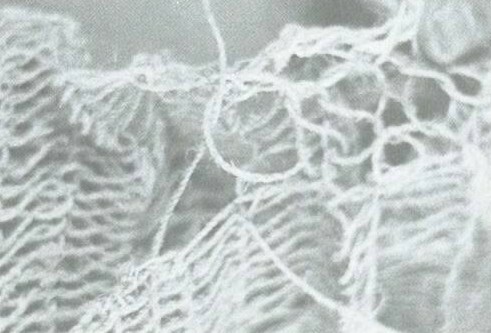 The numerous items using string (71.5%) illustrate how important string was. 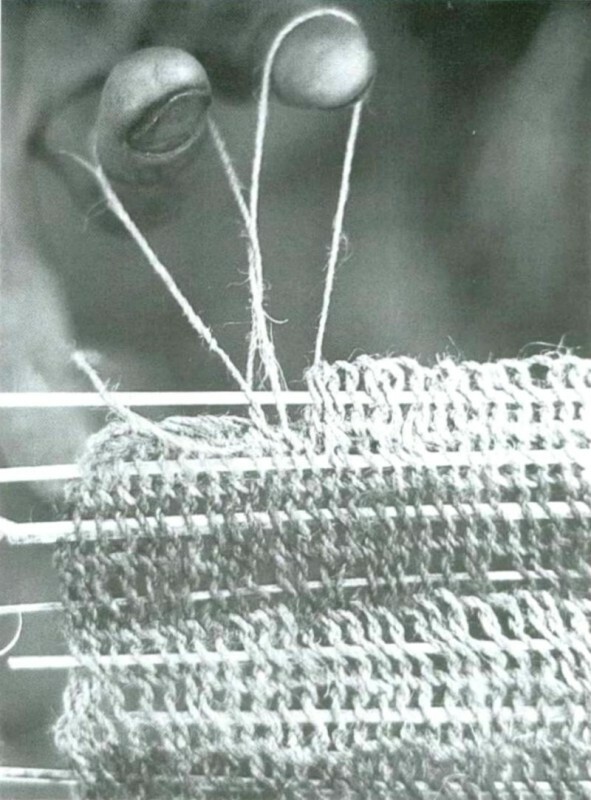 The time spent on string manufacture was the most time-consuming of women's manufacturing tasks (Plates 76-101 illustrate parts of the manufacturing process and some of the many ways in which string was used [all from Sillitoe 1988]) . 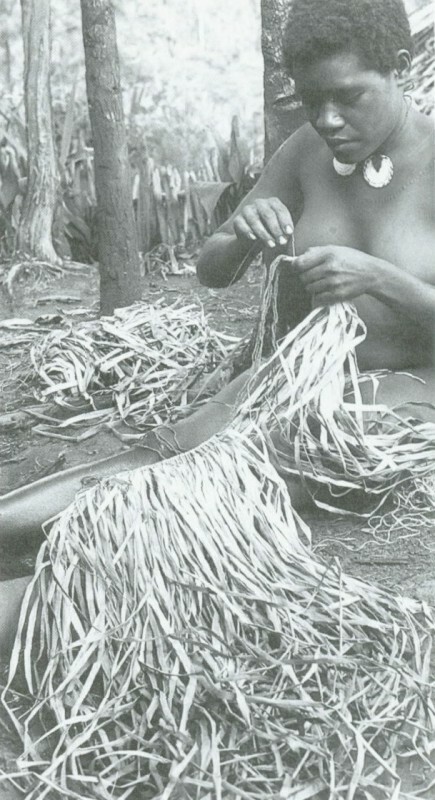 'Soft' organic material (rattan, bark fibre, bamboo etc.) 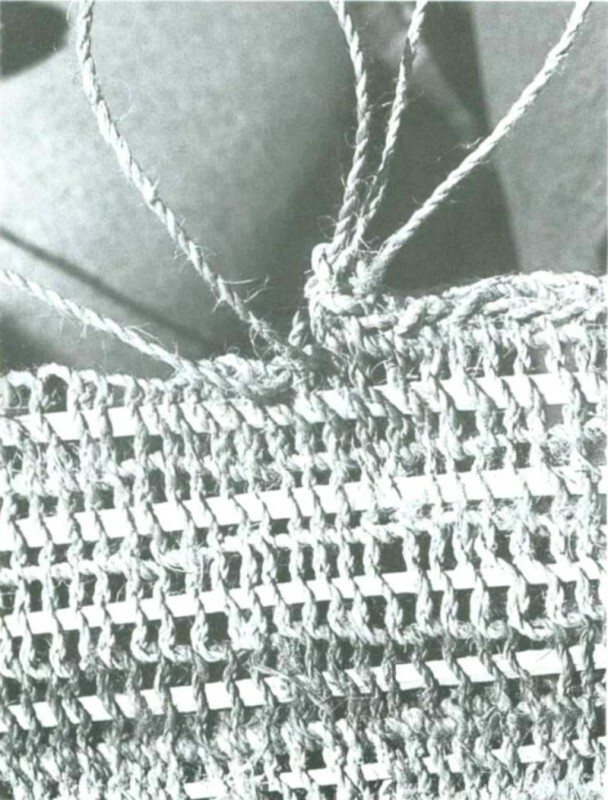 constitutes the majority of the raw materials used; almost all items made had a 'soft' raw material as a component part. 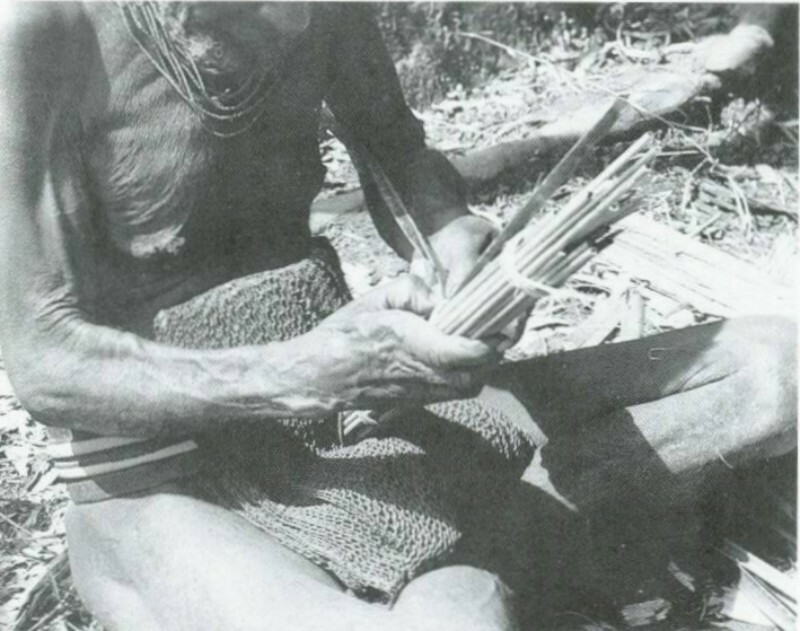 'Soft' raw materials survive only rarely in prehistoric archaeological contexts. 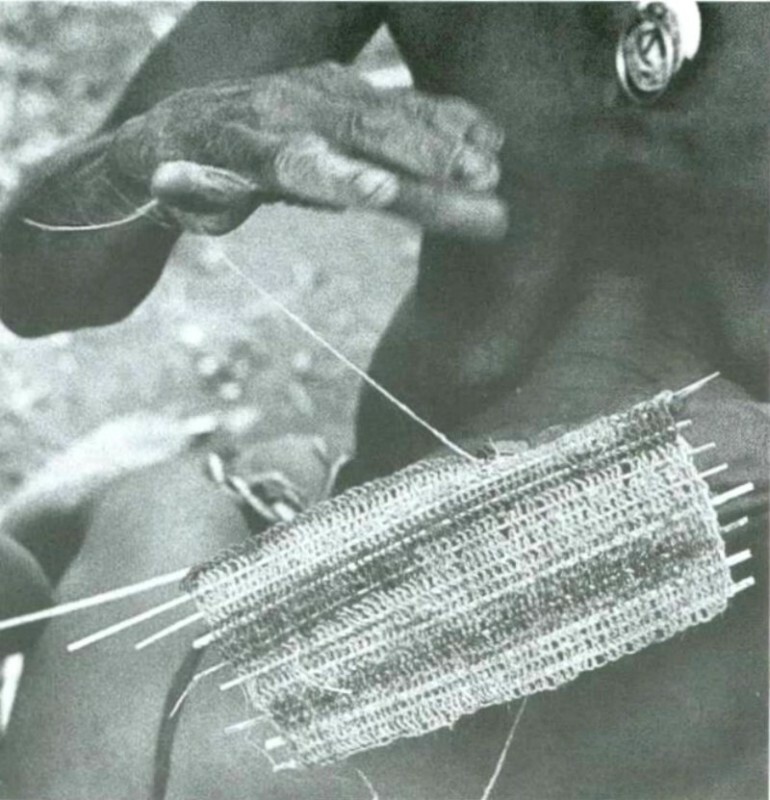 An idea of the time-consuming nature of string making can be gauged from the following description. 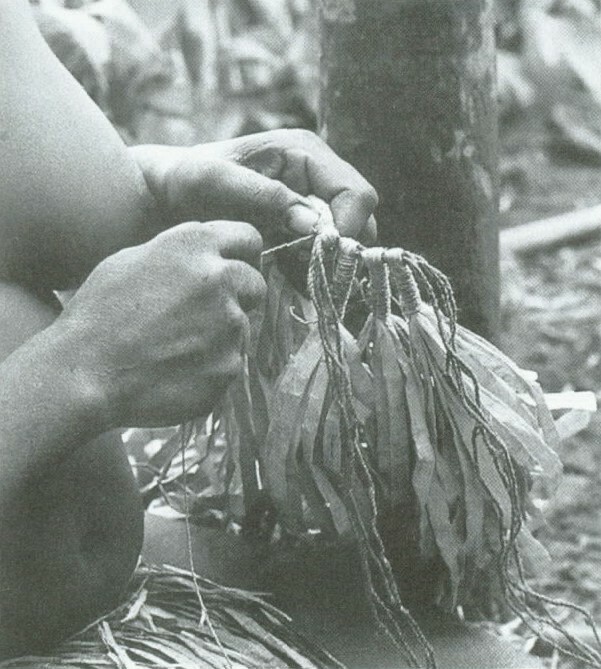 "She strips the bark off the saplings she collects and peels the cambium fibre...away from the outer bark or shongol (lit. 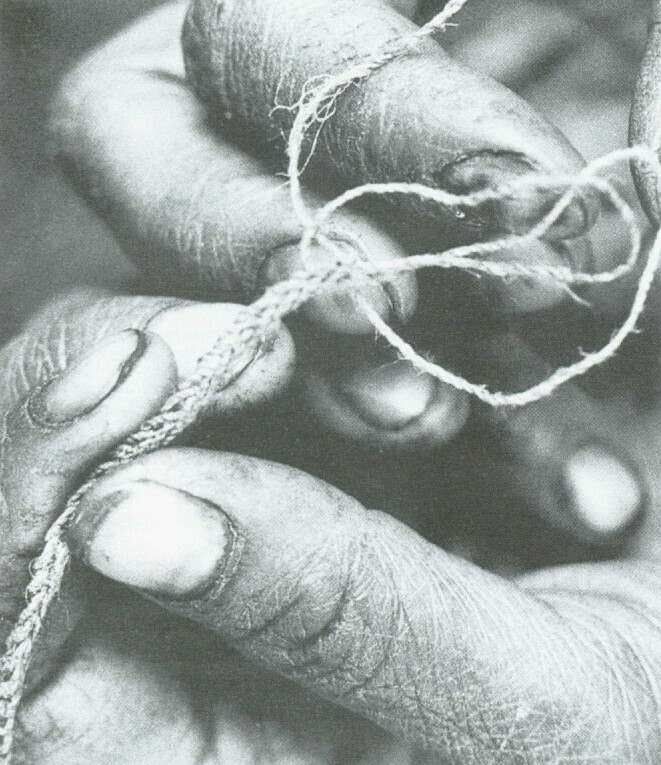 skin) which she discards. 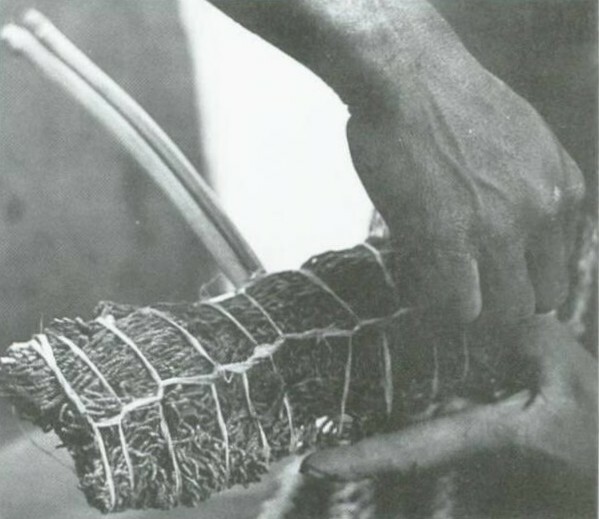 She allows the bark to dry first before stripping off its fibre, slitting the wands gathered lengthwise in two and placing them indoors over a fire, leaving them for about a week. 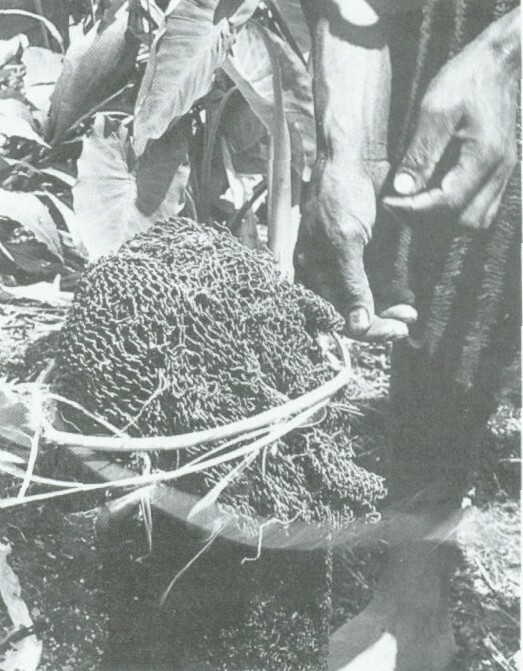 But the fibre of ponjip figs, she may strip off green and dry separately; women often excoriate these saplings during collection, returning home with bags of unseparated bark..., and there peeling off and drying the bast. 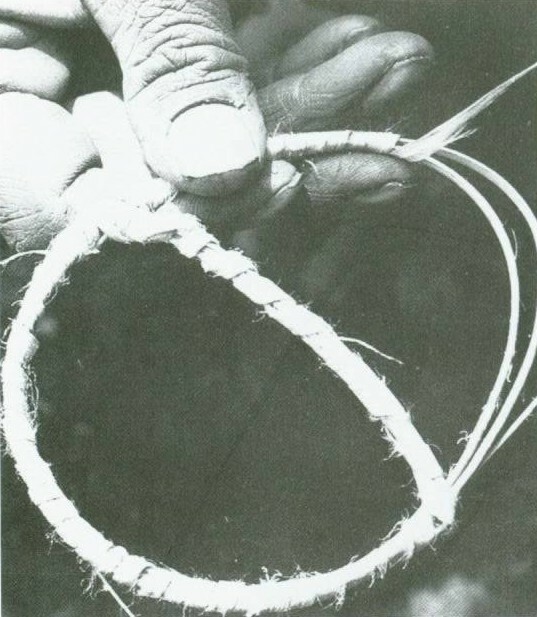 On average, 5g of dry phloem fibre will produce 10 metres of string. 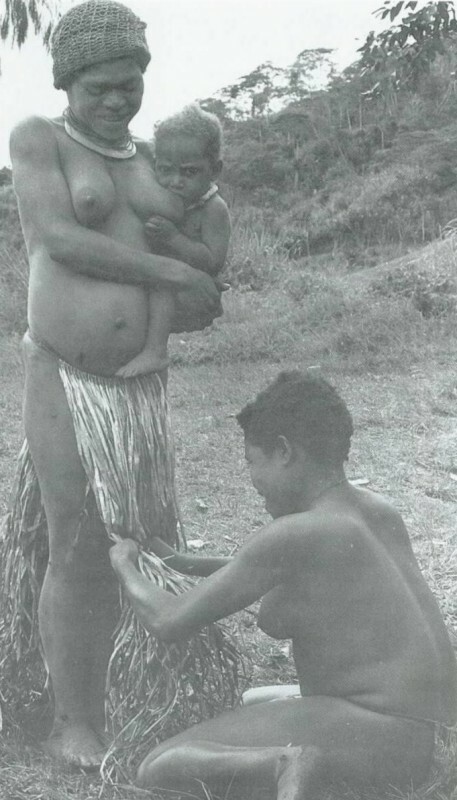 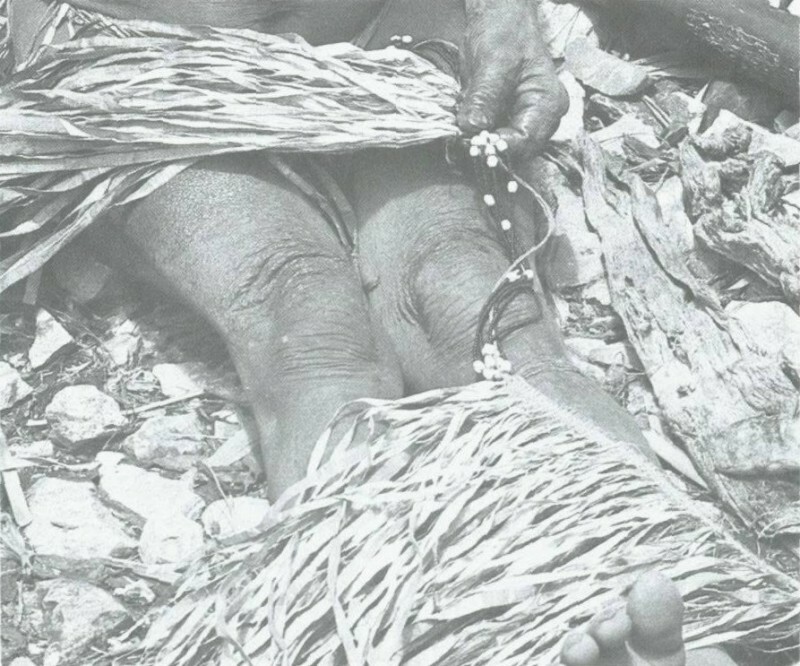 A woman shreds the dry fibre into thin strands called ya diyr to make string, and twists these into threads or kuwmiy by rolling a few pieces at a time between her thigh and palm away from her body. 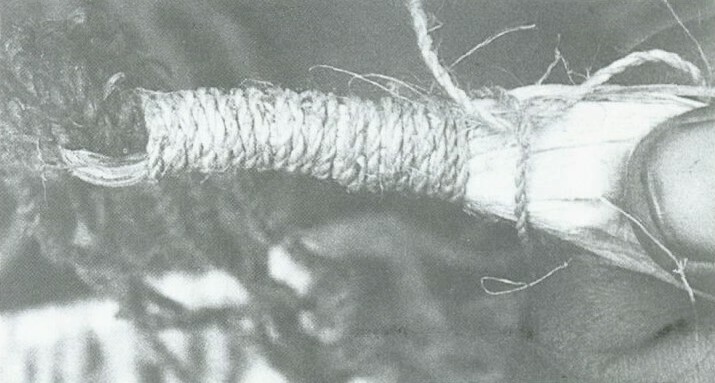 She produces continuous lengths of kuwimy by twisting these fibre strands one to another. 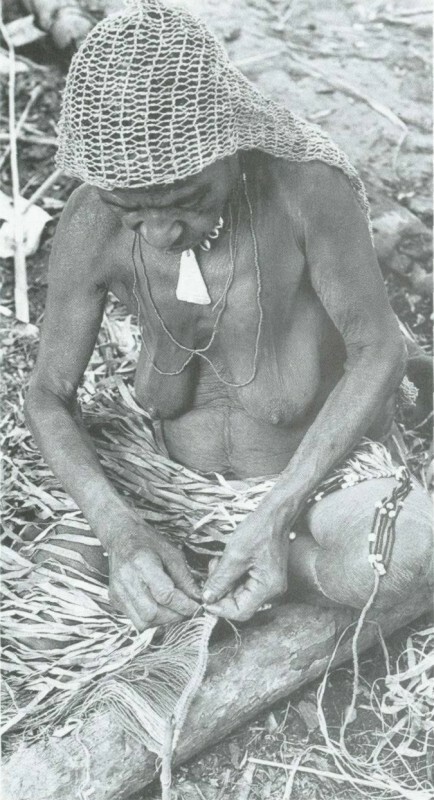 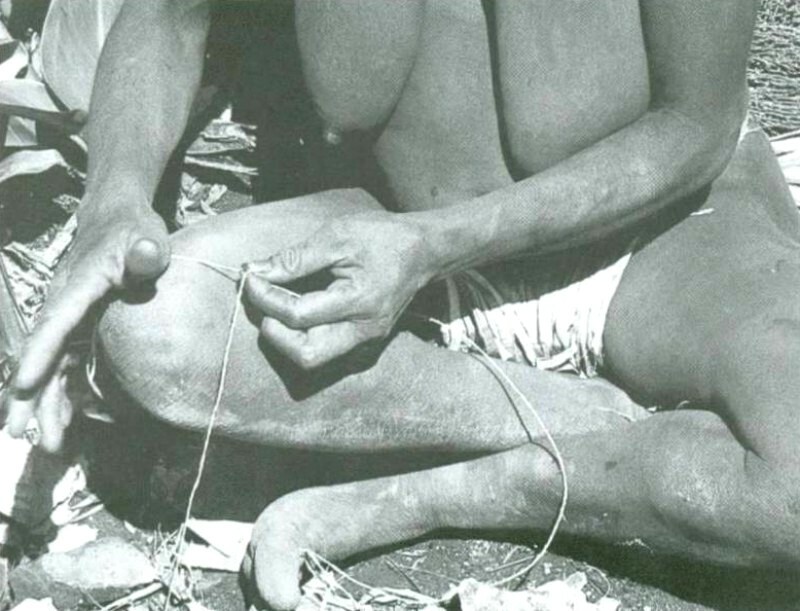 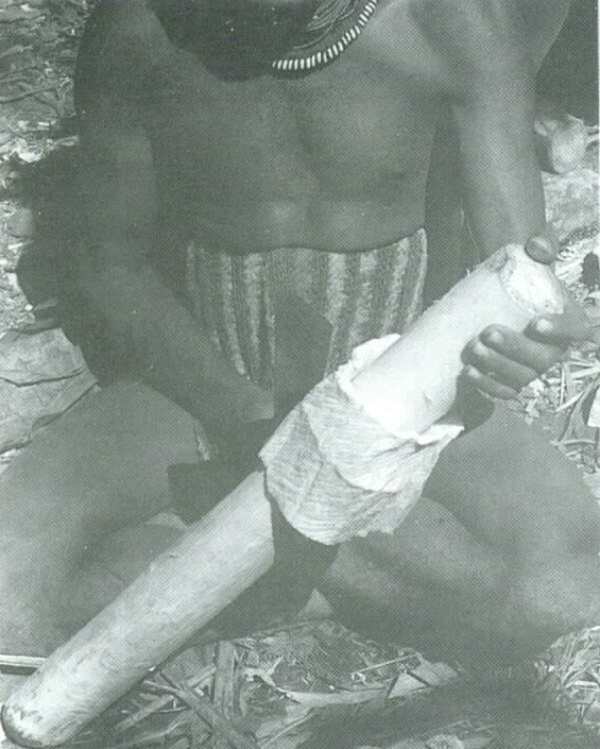 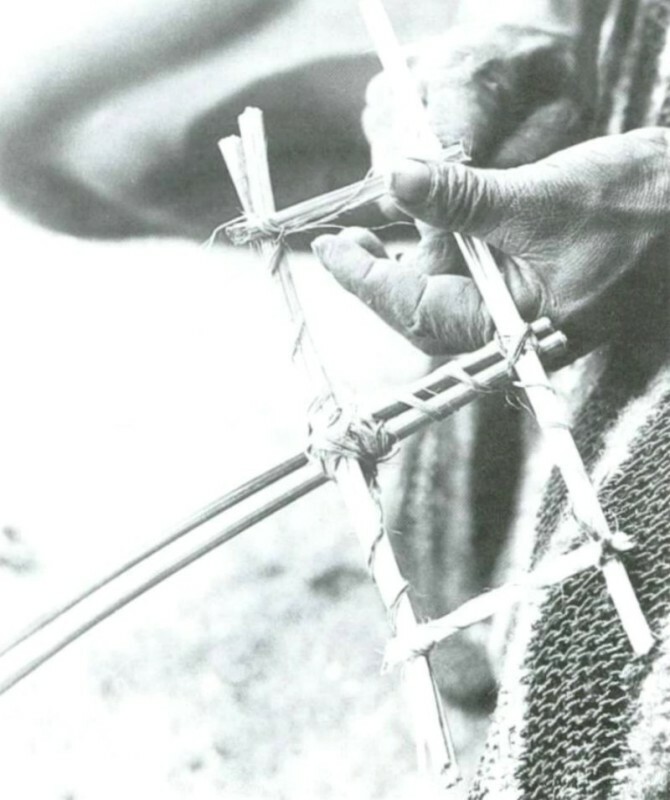 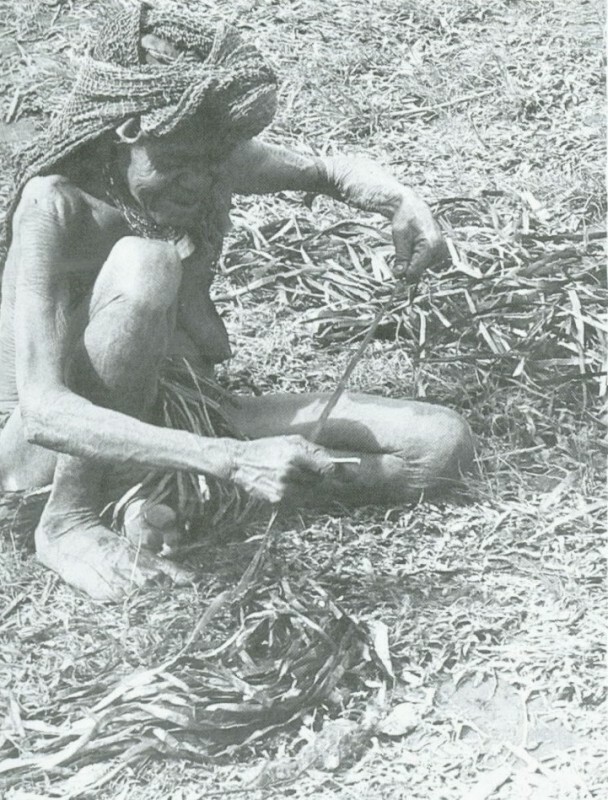 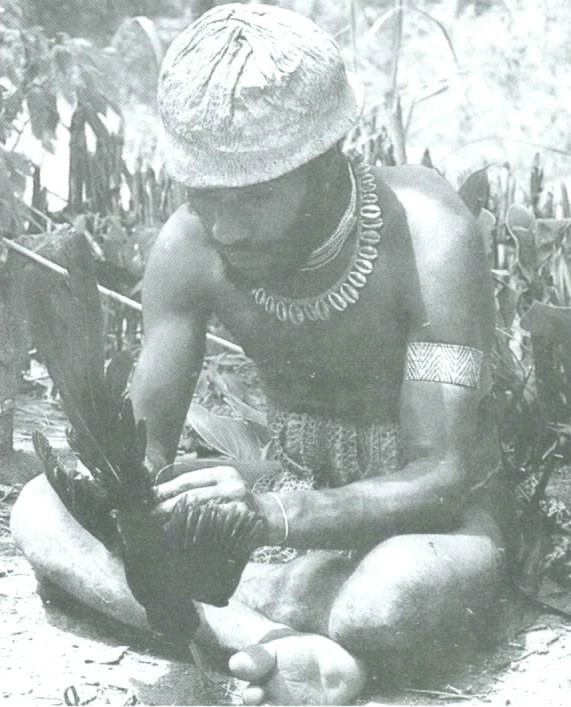 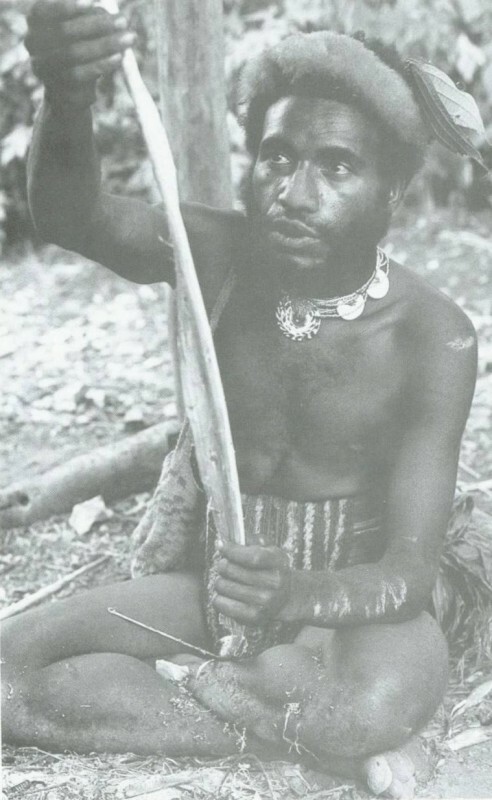 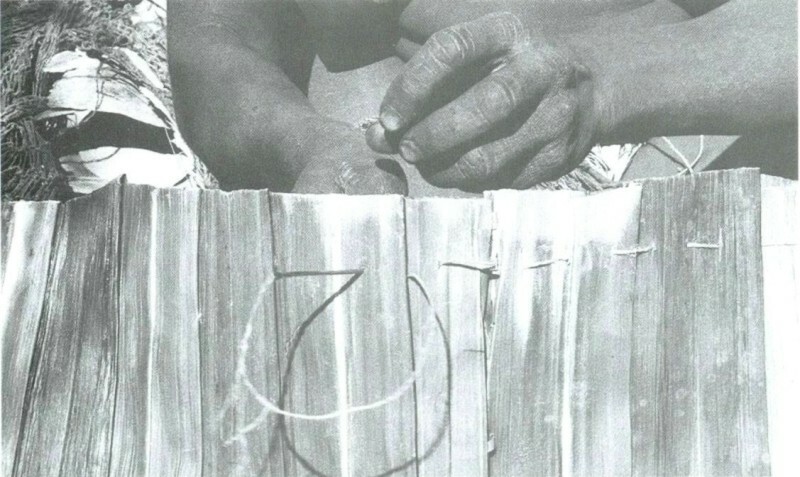 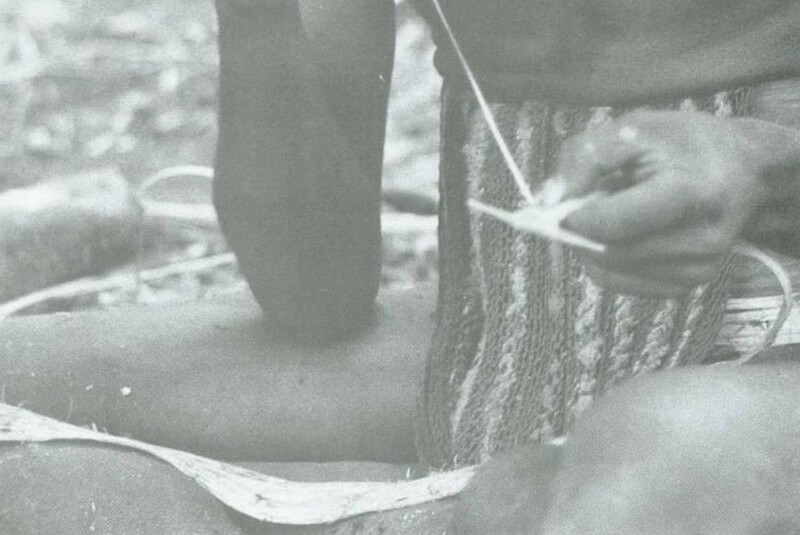 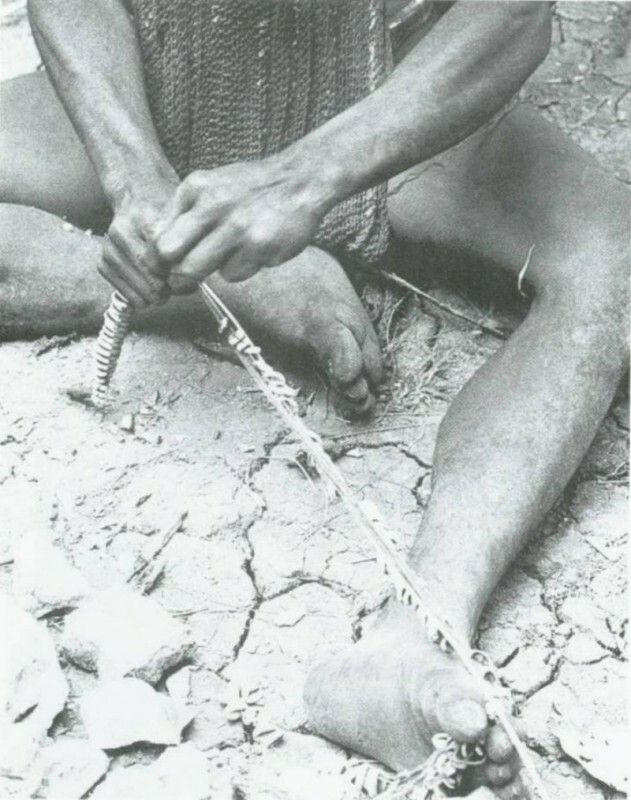 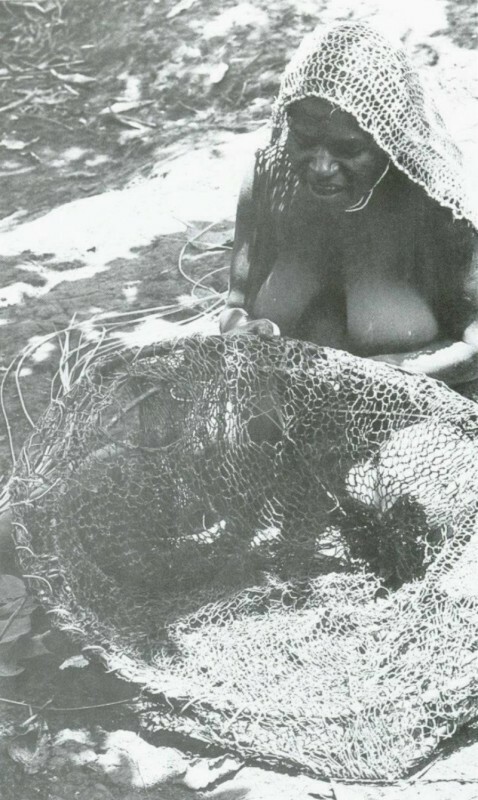 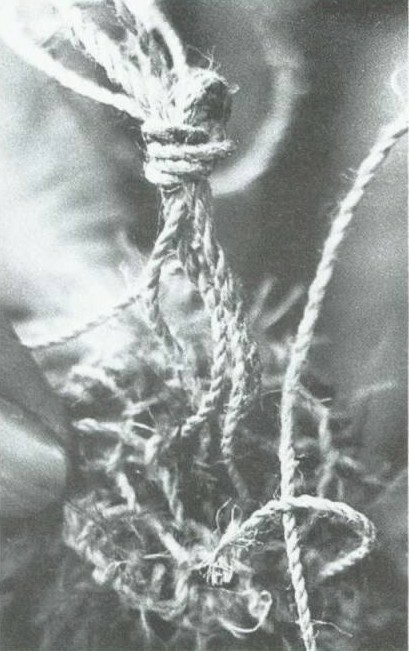 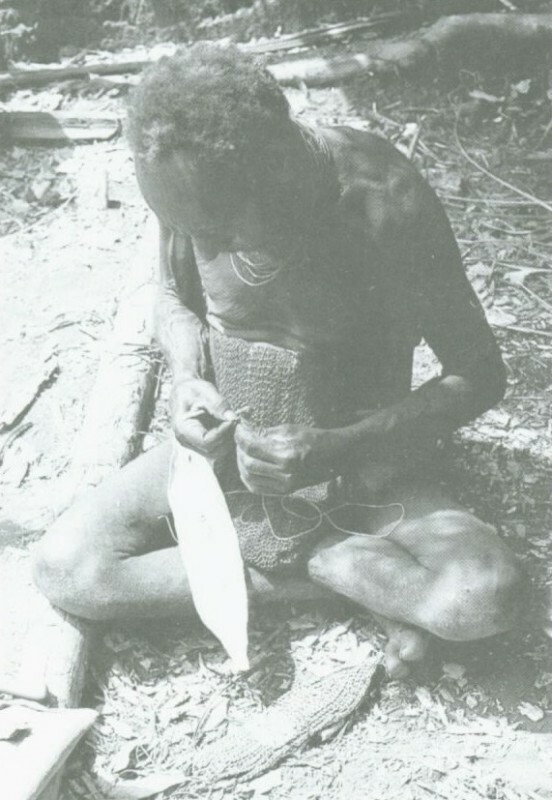 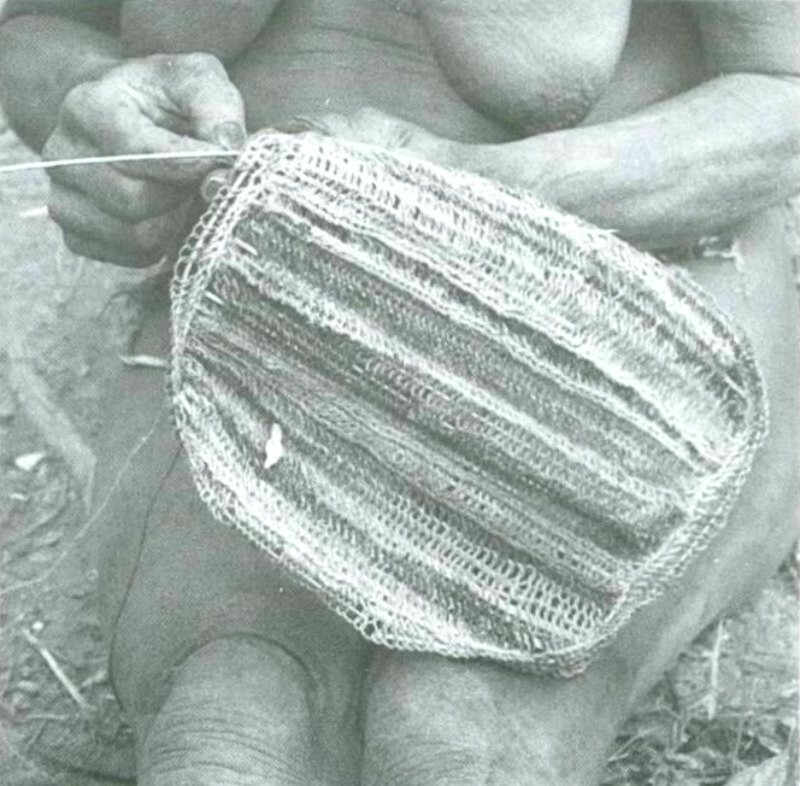 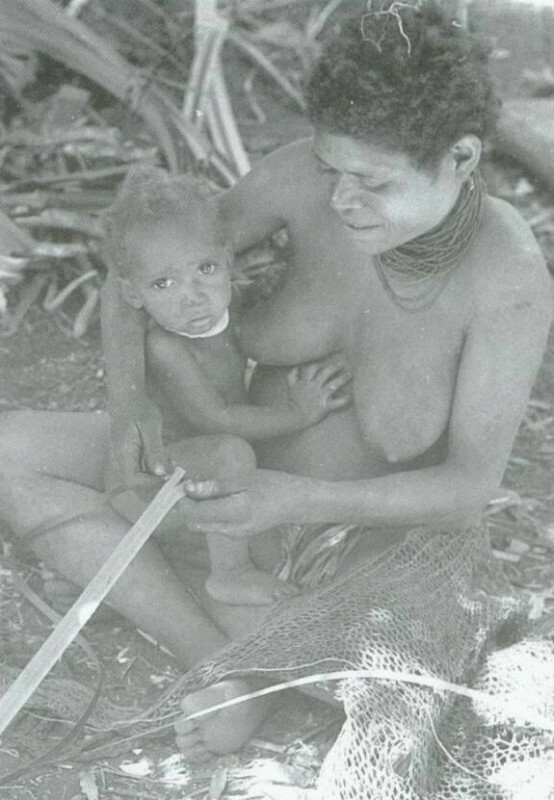 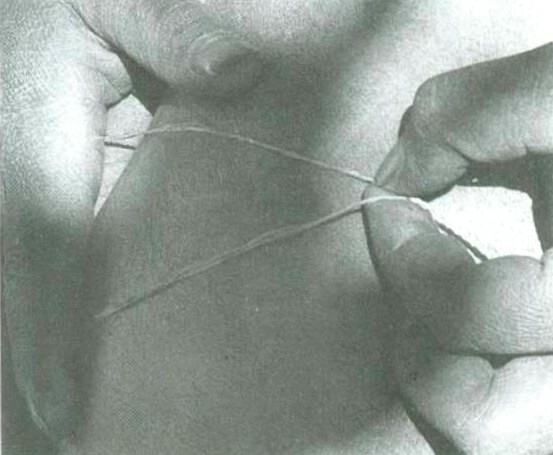 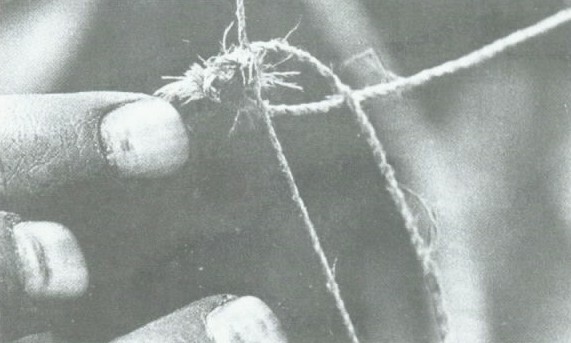 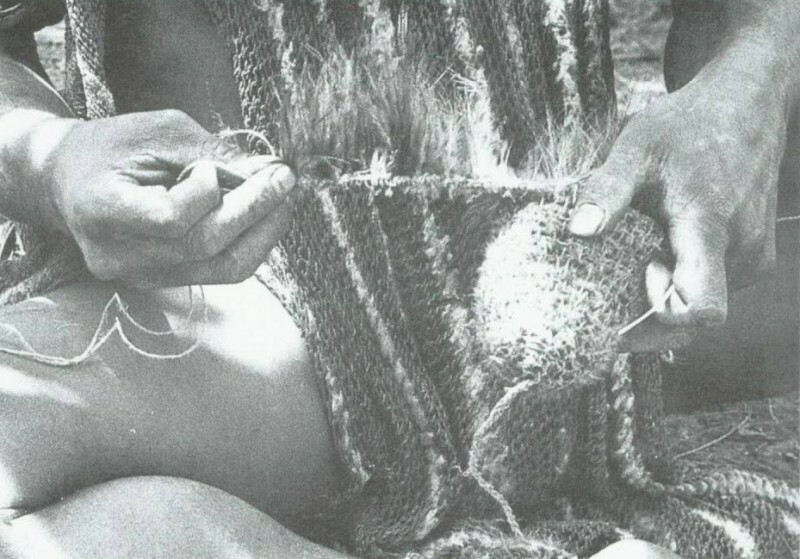 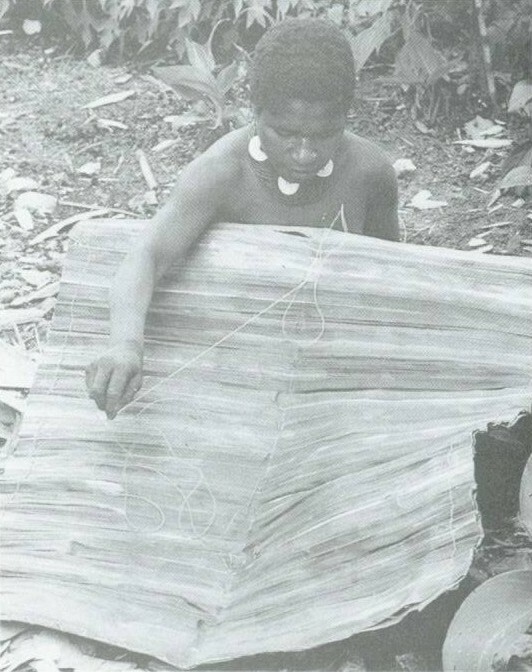 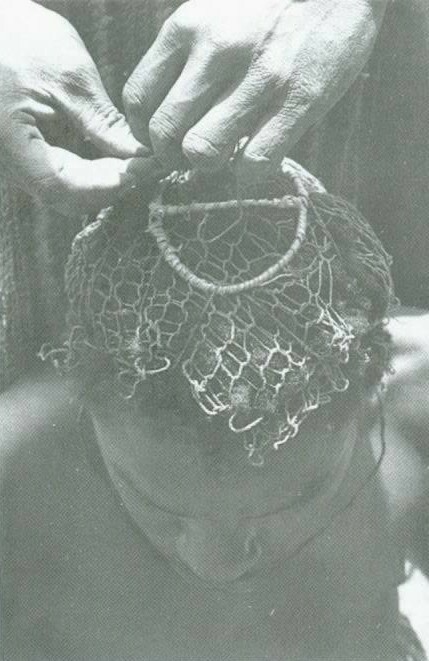 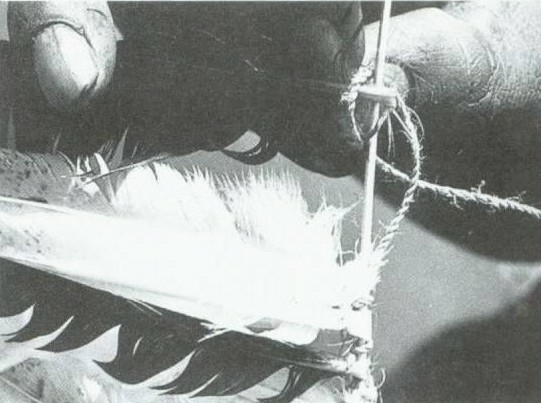 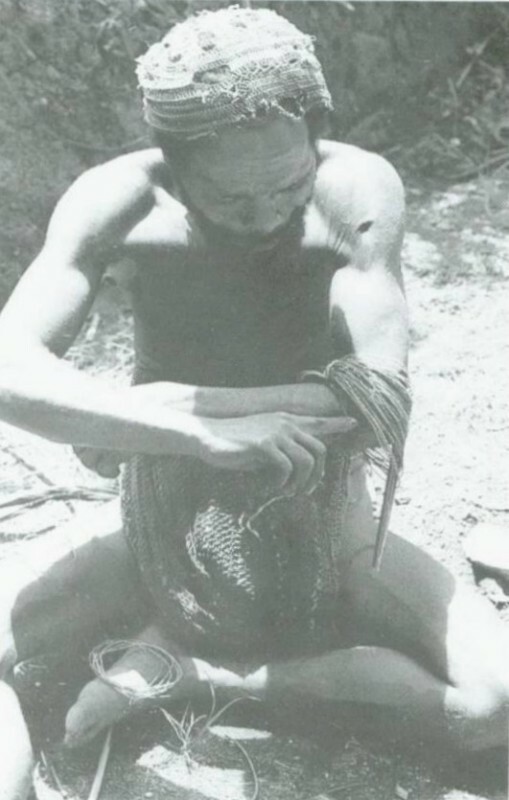 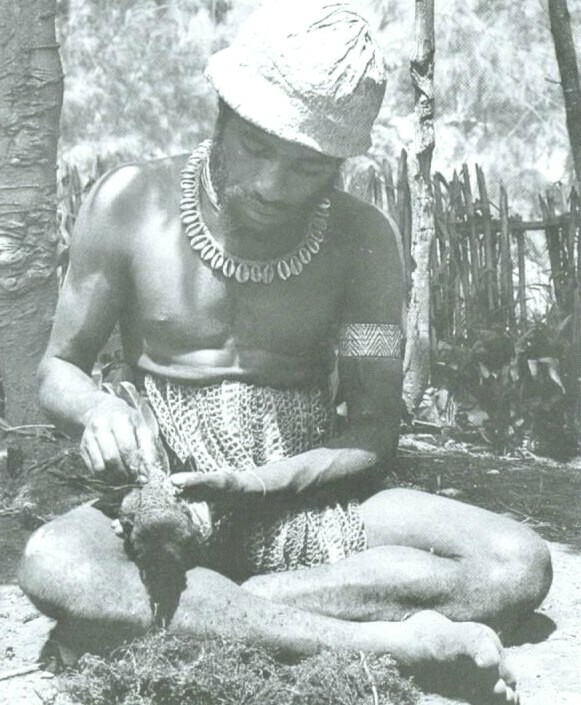 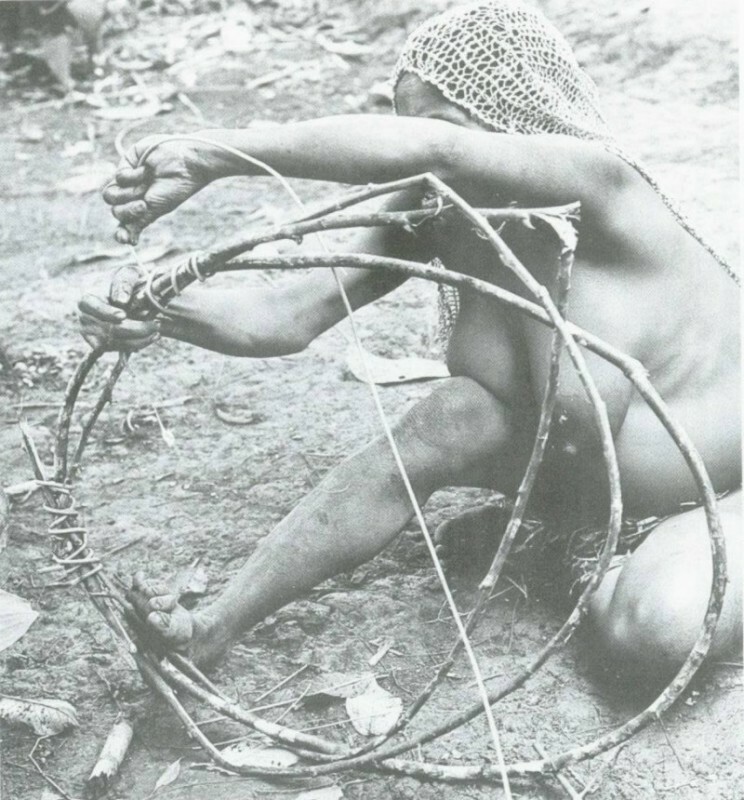 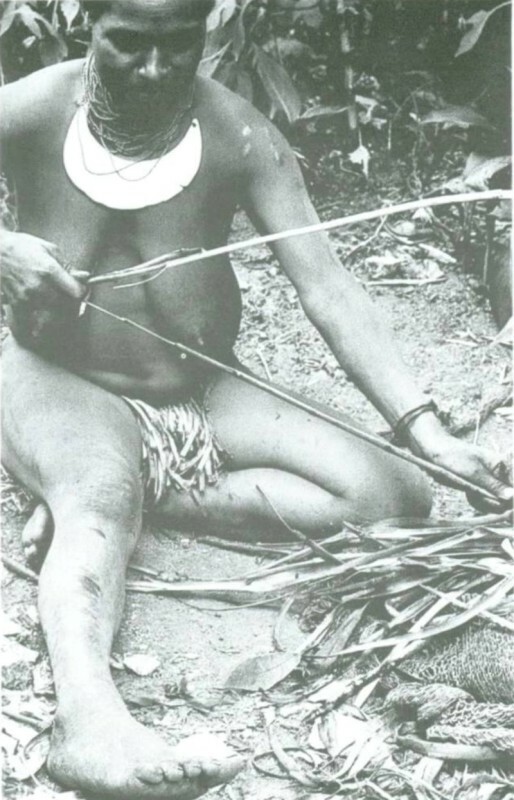 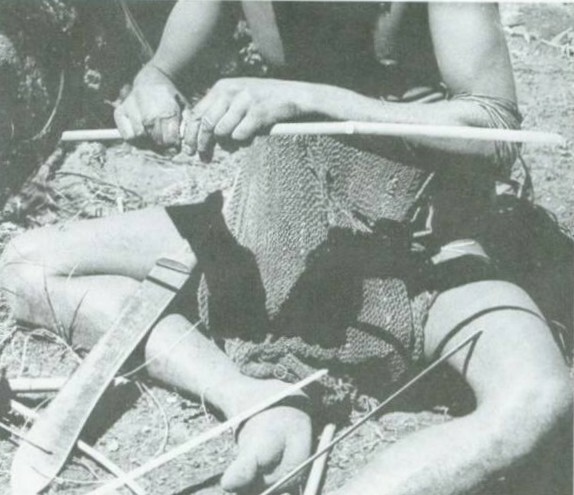 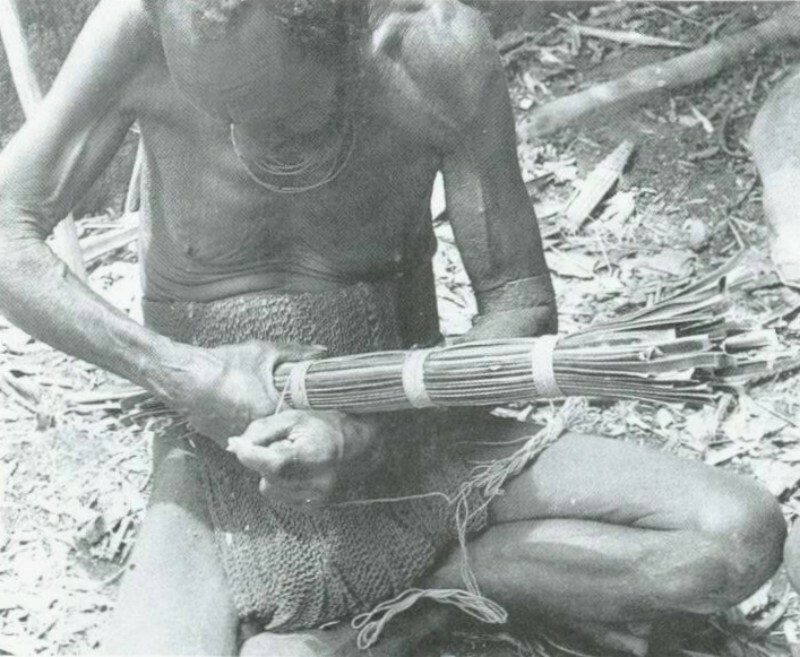 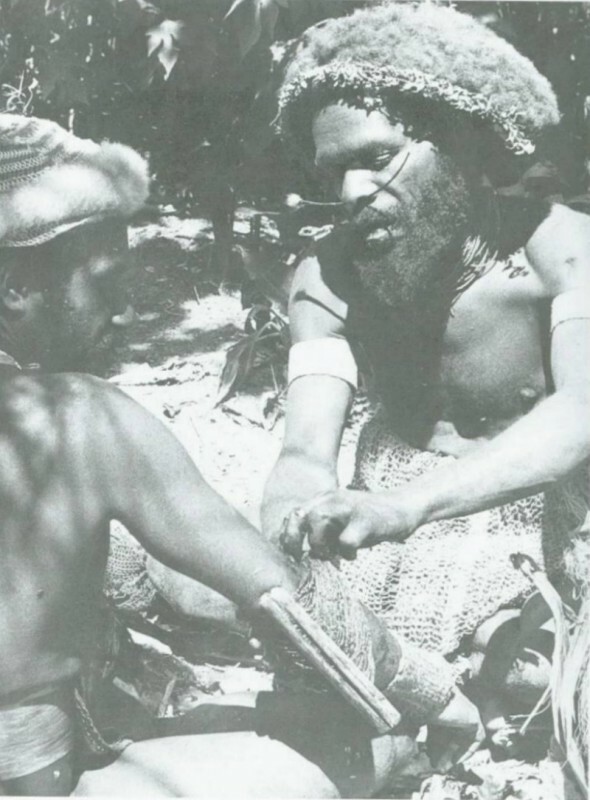 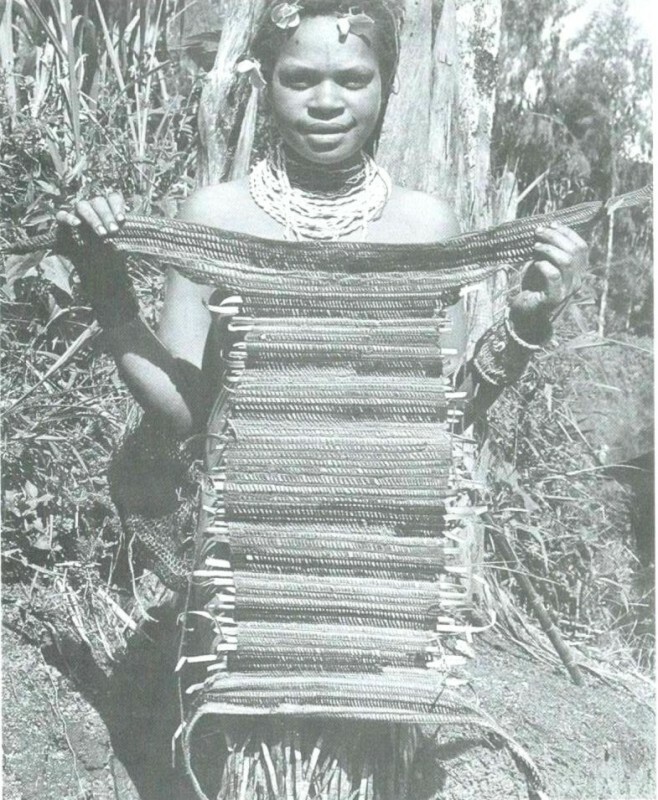 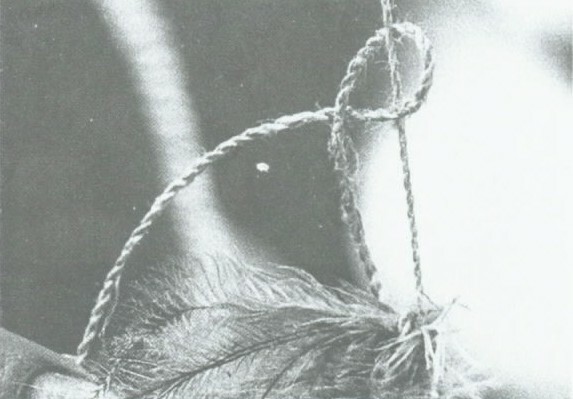 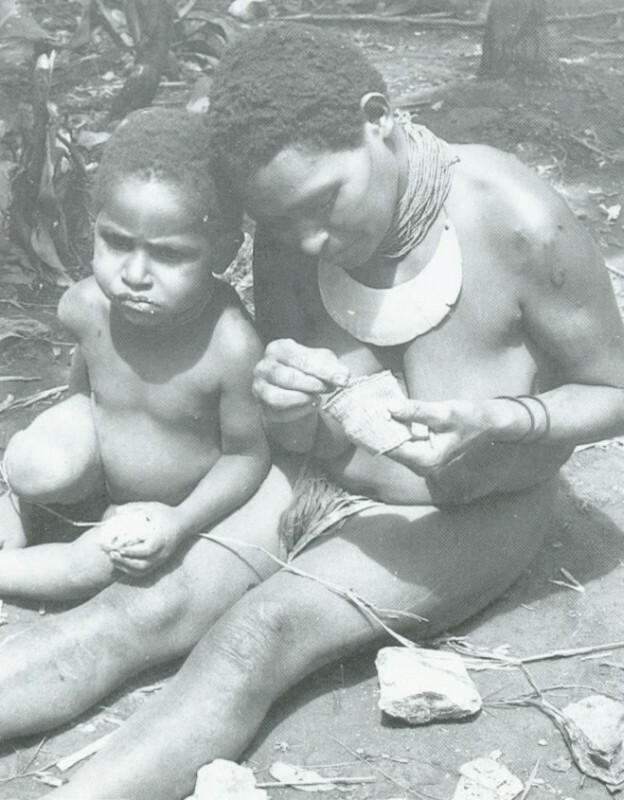 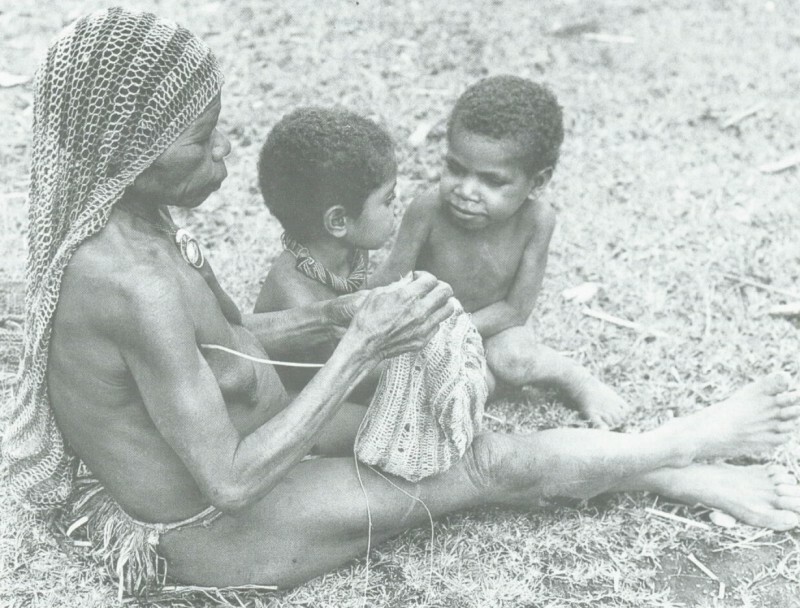 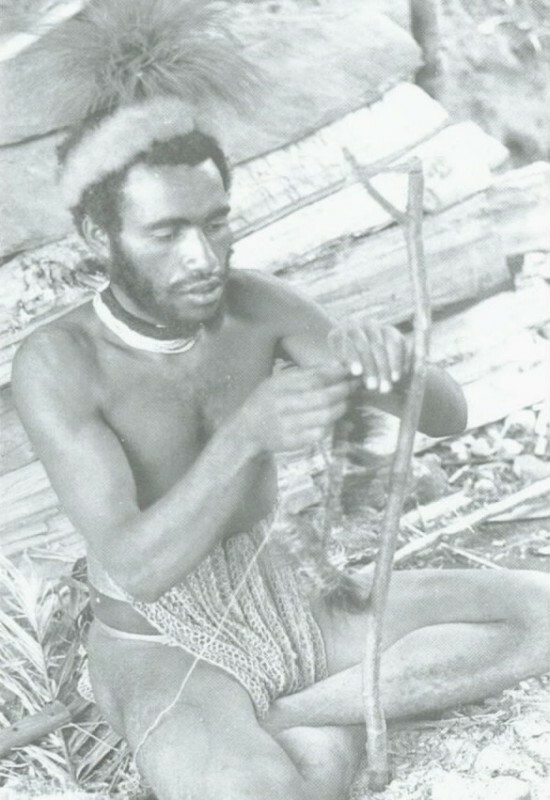 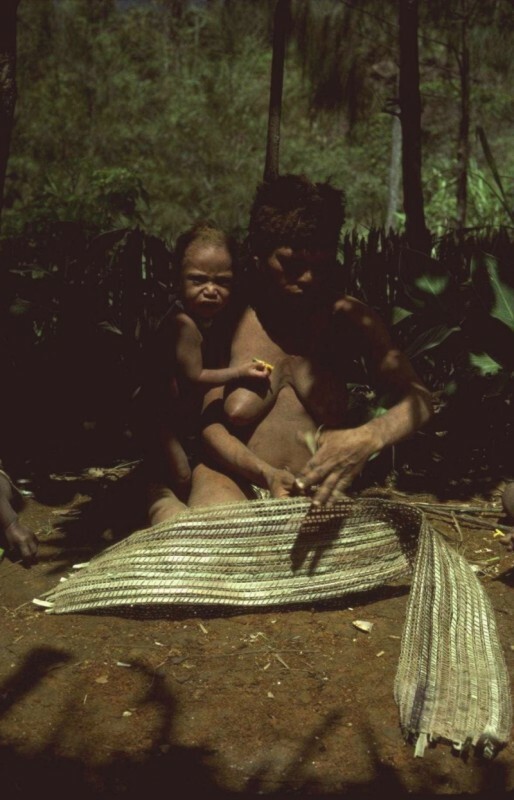 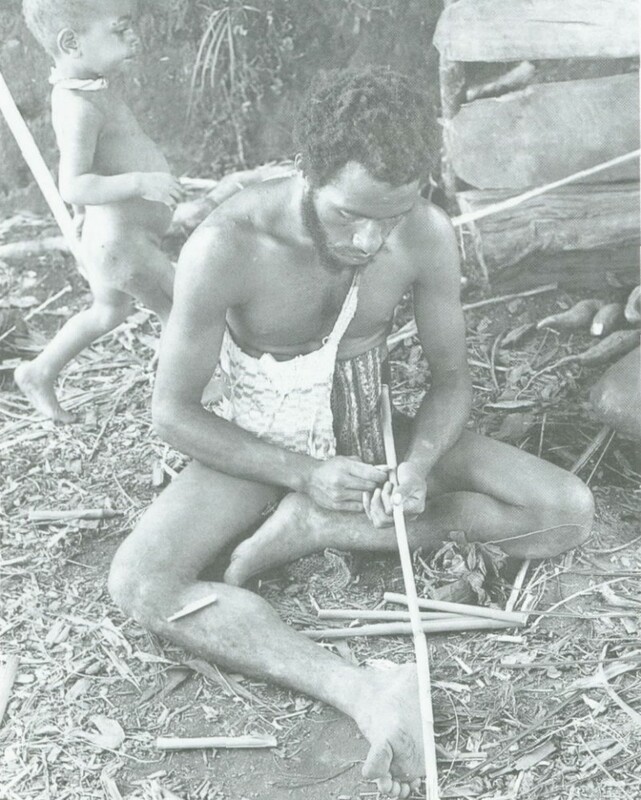 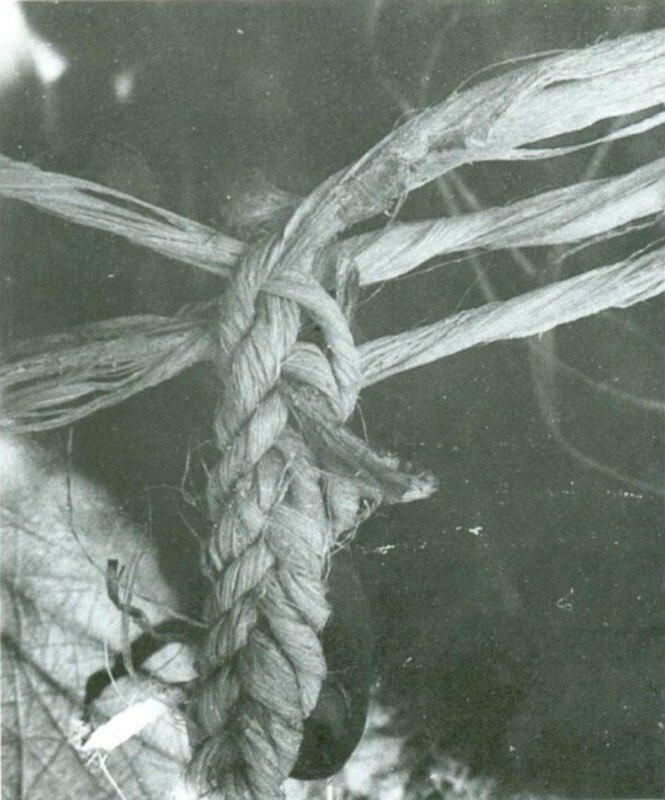 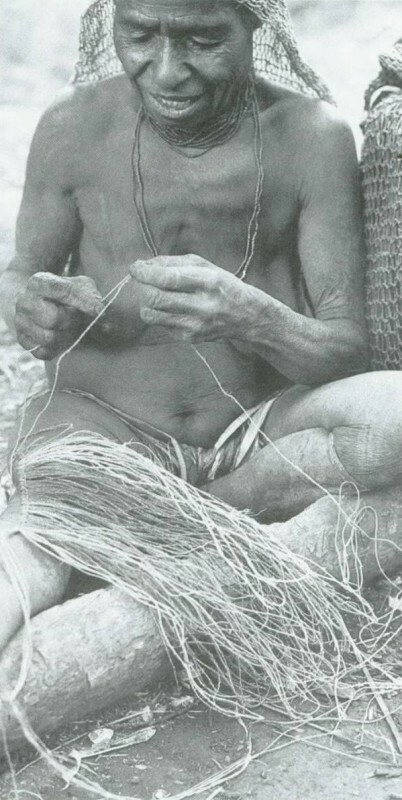 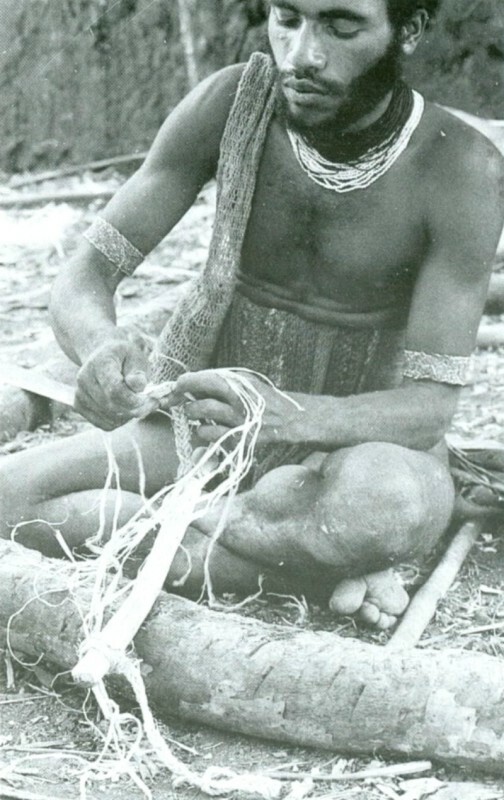 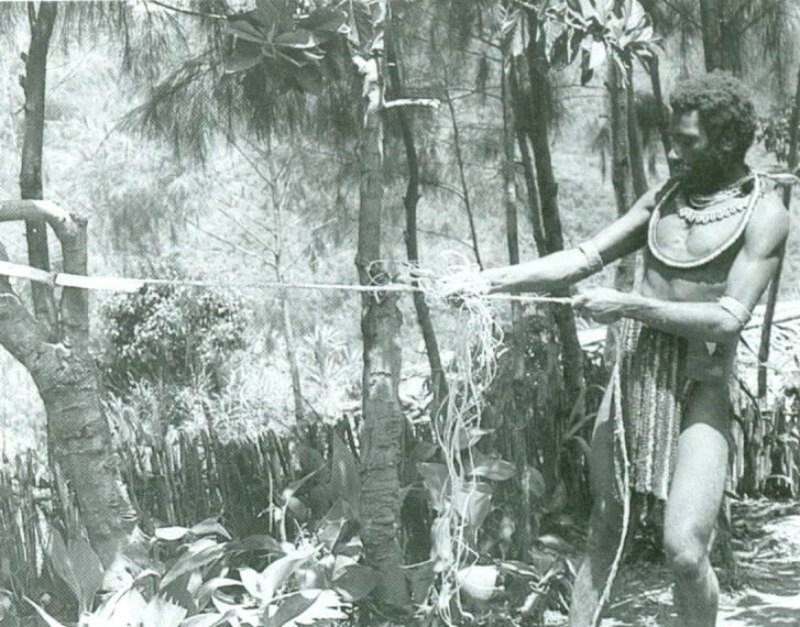 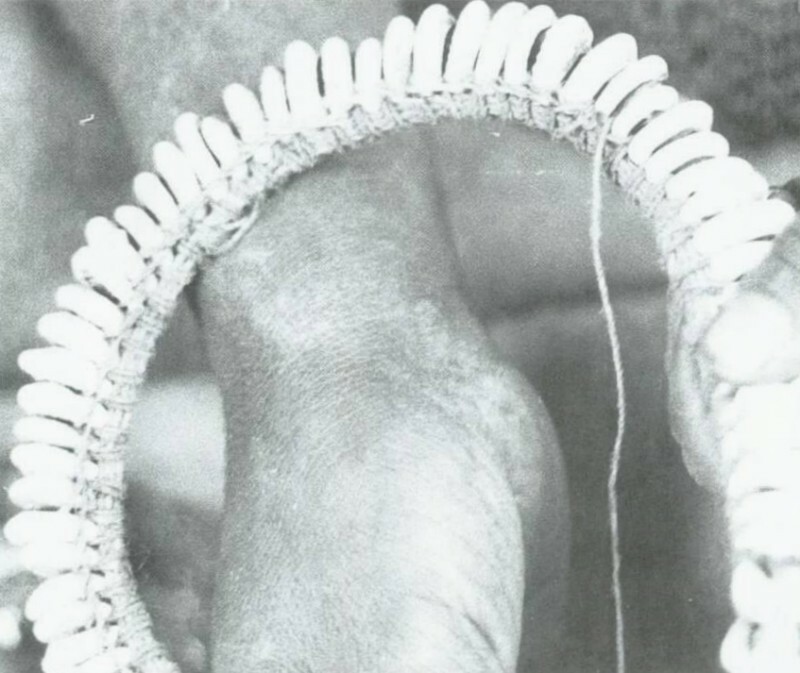 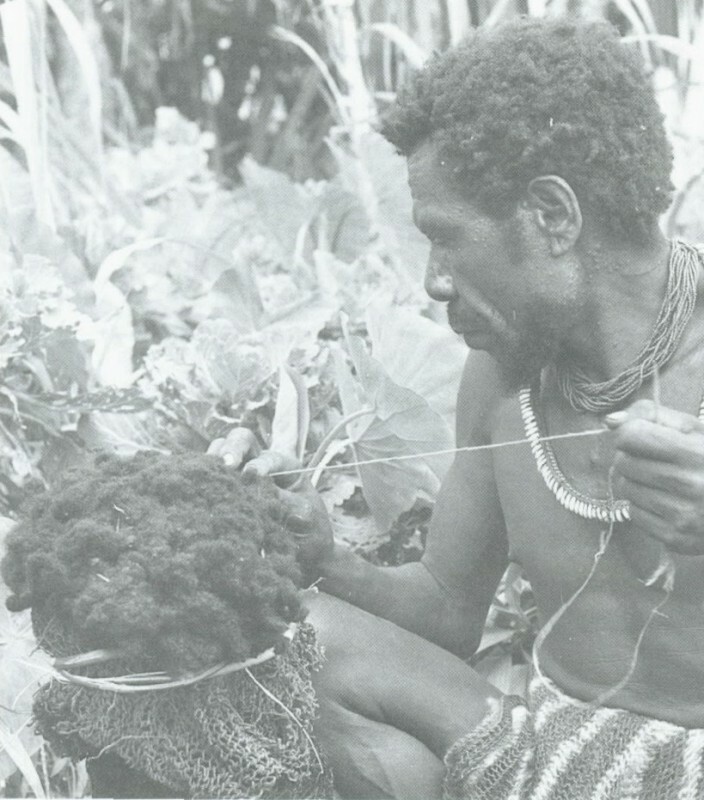 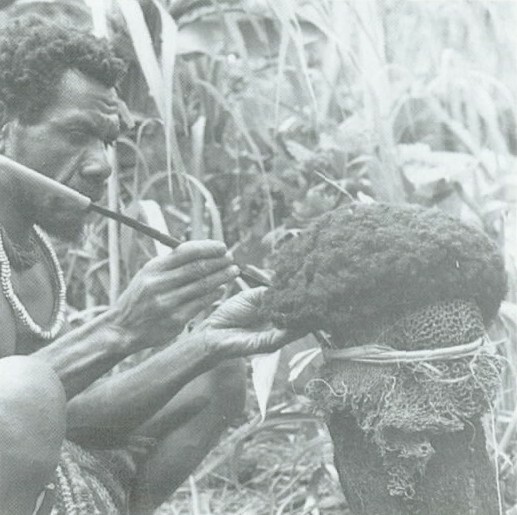 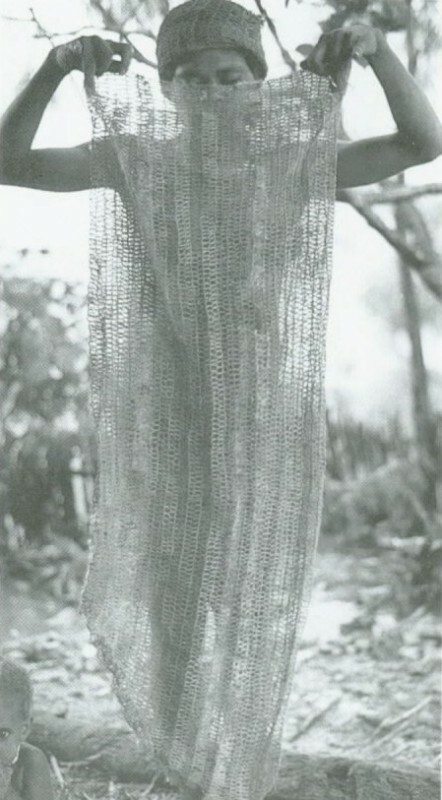 String consists of two such kuwimy threads rolled together between thigh and palm to give a two-stranded twine called kobel. 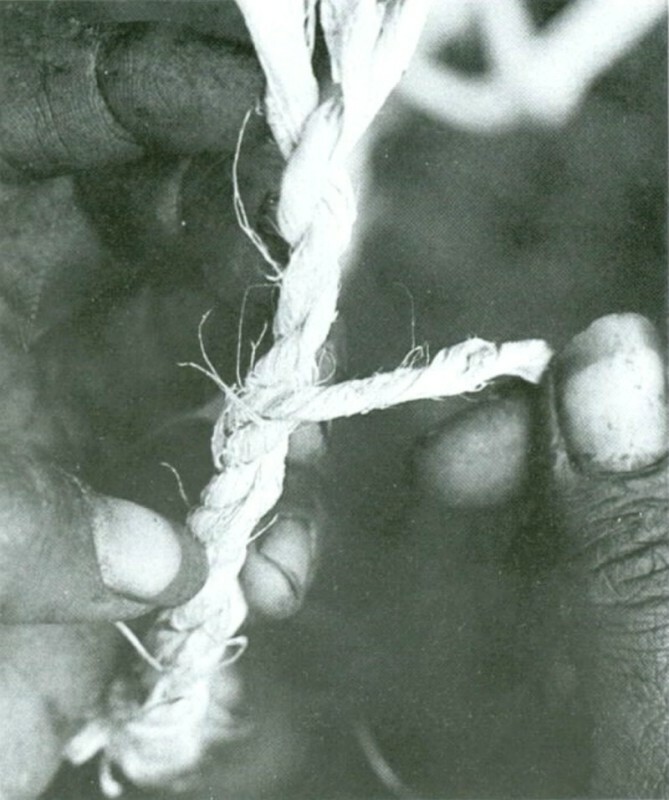 A woman rolls it in two movements, pushing her hand down her thigh to twist the two strands together and then pulling it back up again to firm their lay. 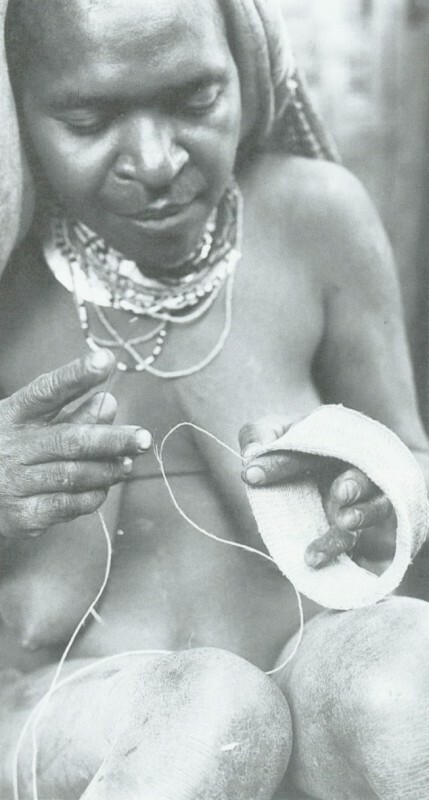 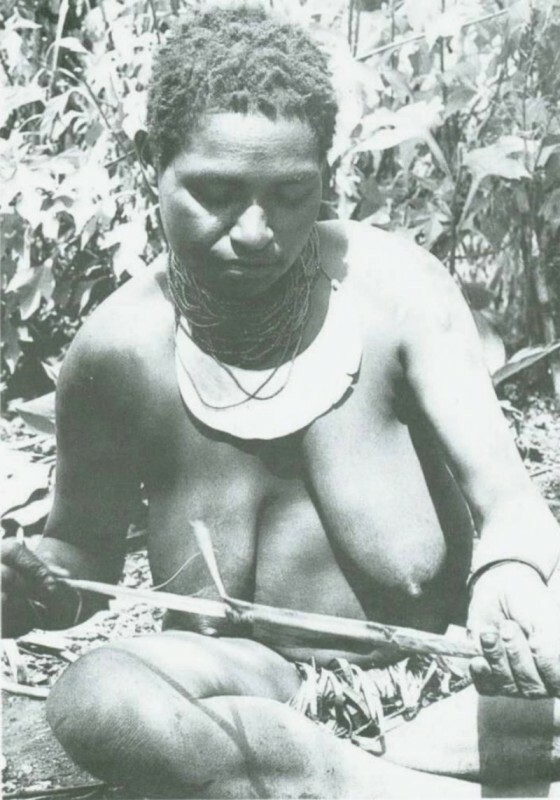 She twists the kuwimy threads and kobel twine simultaneously, adding ya diyr strands to the former and rolling them until c. 20cm long, and then entwining them together into string, proceeding until she has a sizeable hank." 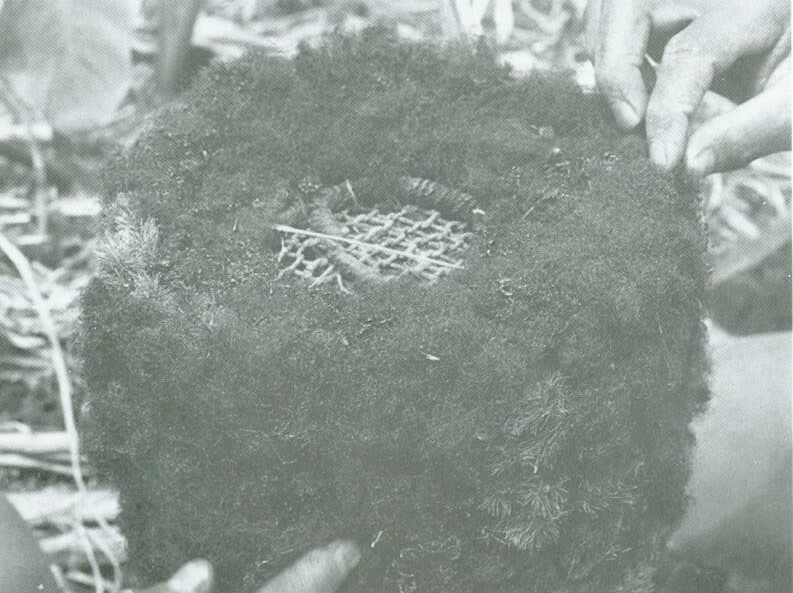 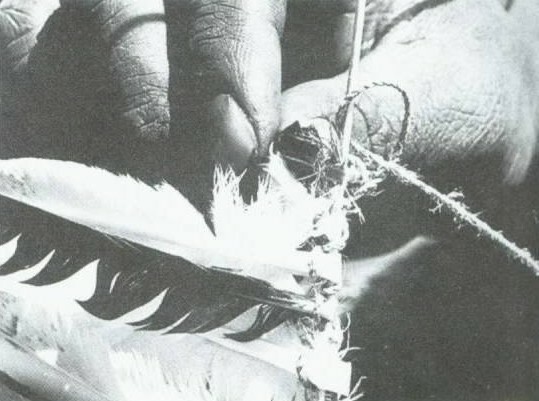 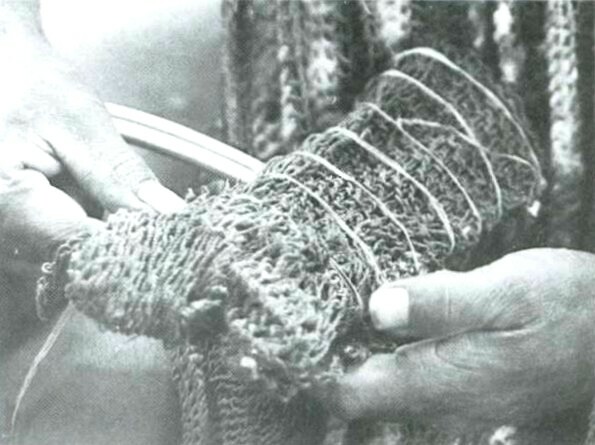 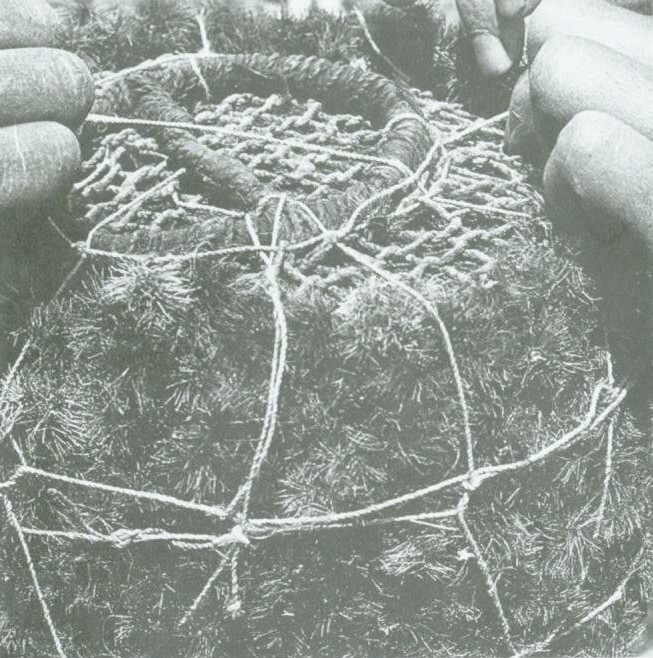 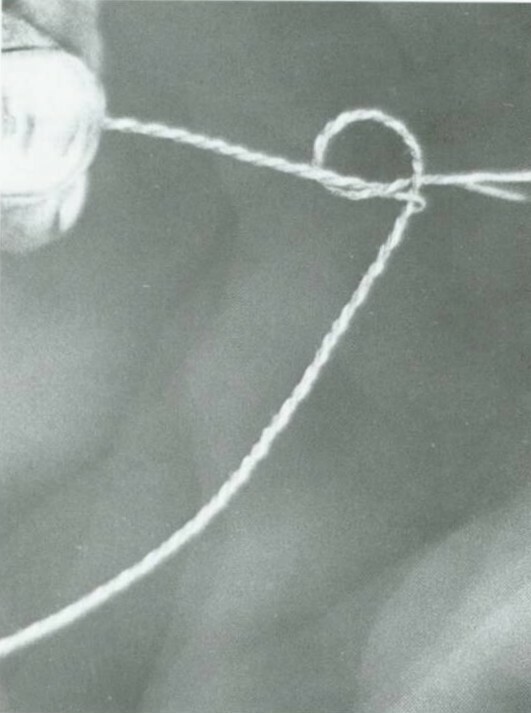 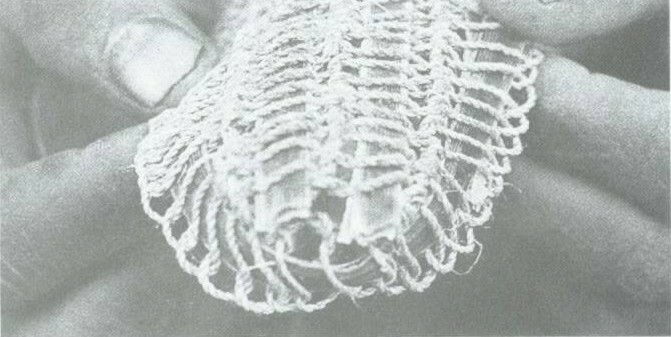 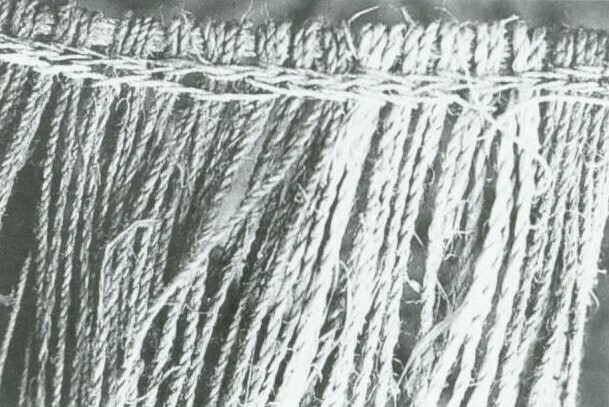 MacKenzie (1991) gives a very detailed description of string making that includes the heating process for isolating the bast fibres, the methods of drying the fibres, the moistening of the fibres before twisting as well as the actual spinning process itself. 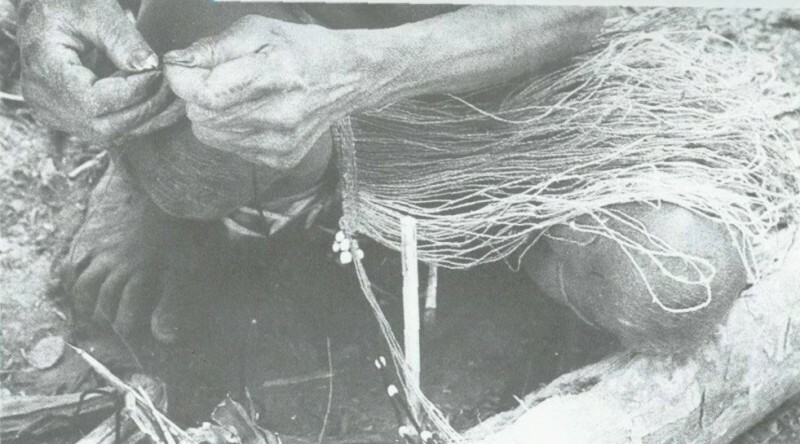 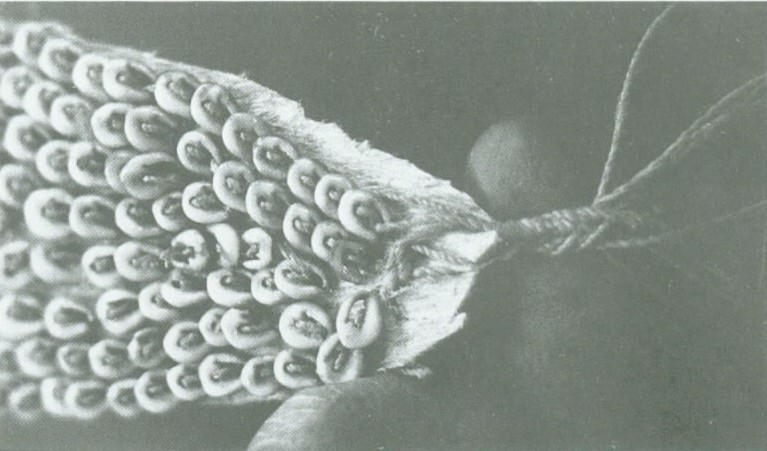 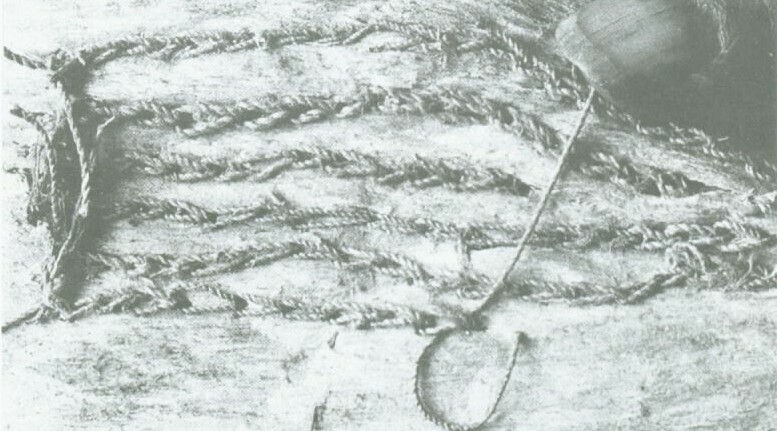 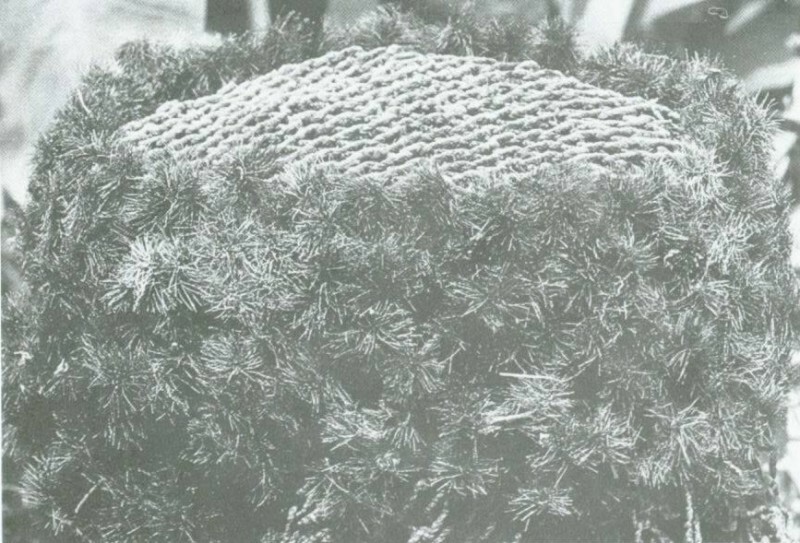 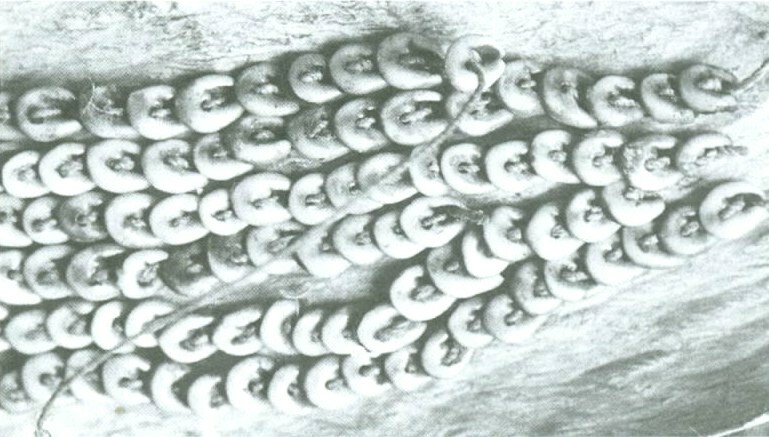 Her time estimates differ slightly to those described above though this may be related to the amount of string being prepared, with up to 14 hours over a period of two weeks required for separation, and preparation of the fibres, then around 60 hours worth of spinning to produce enough string to make an average sized bilum. 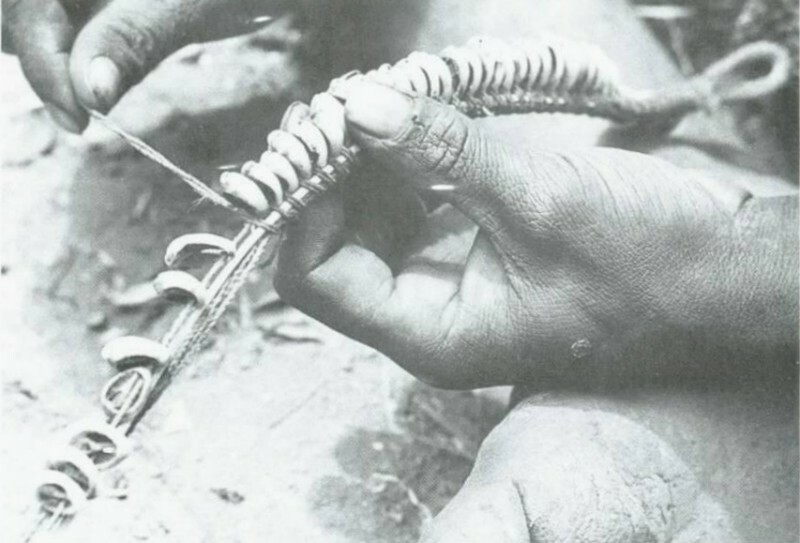 These accounts serve to illustrate the time-consuming nature of string making. 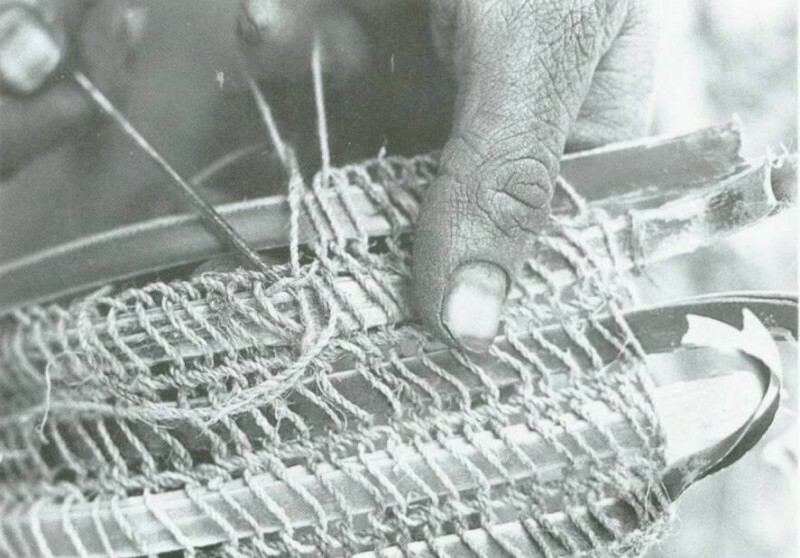 While making string will have varied according to the raw materials used in different environmental zones, all string making using natural resources requires a lengthy preparation time even before spinning takes place. 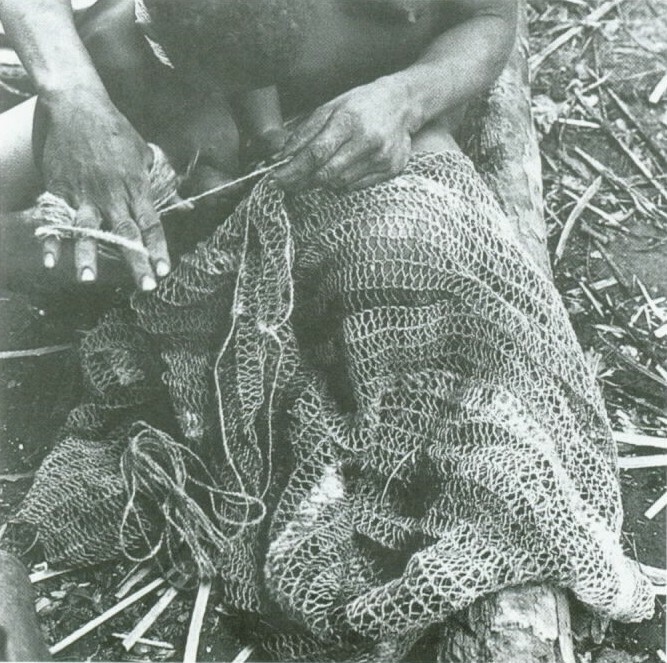 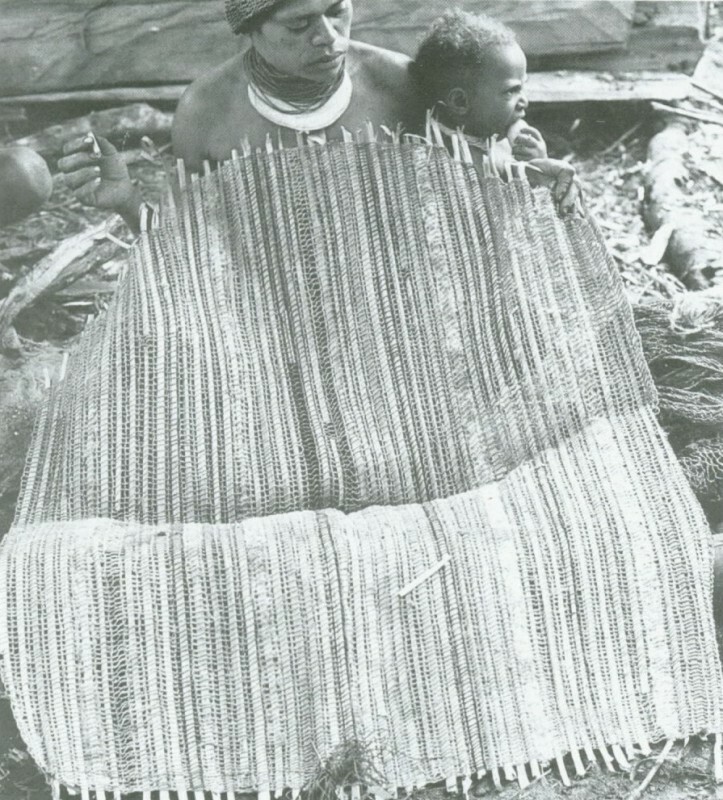 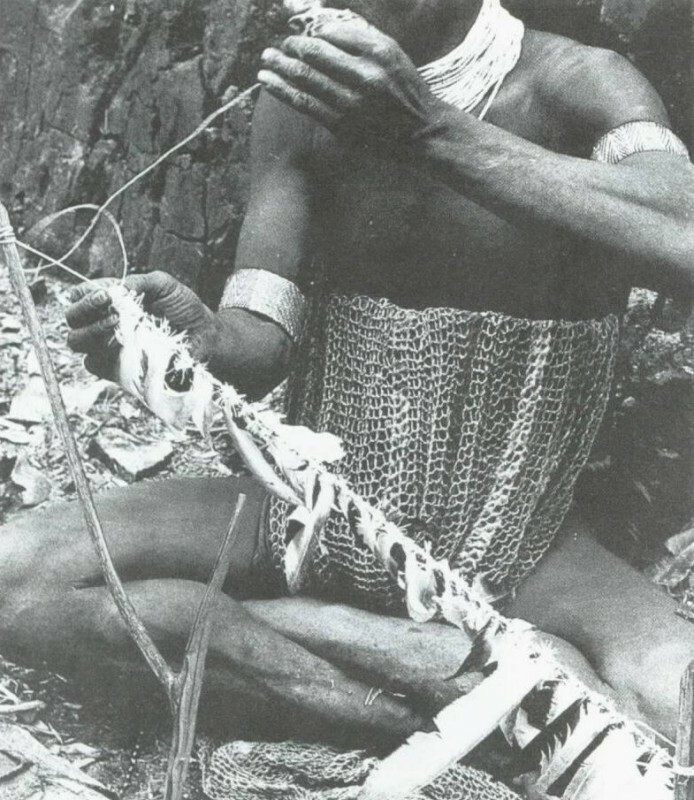 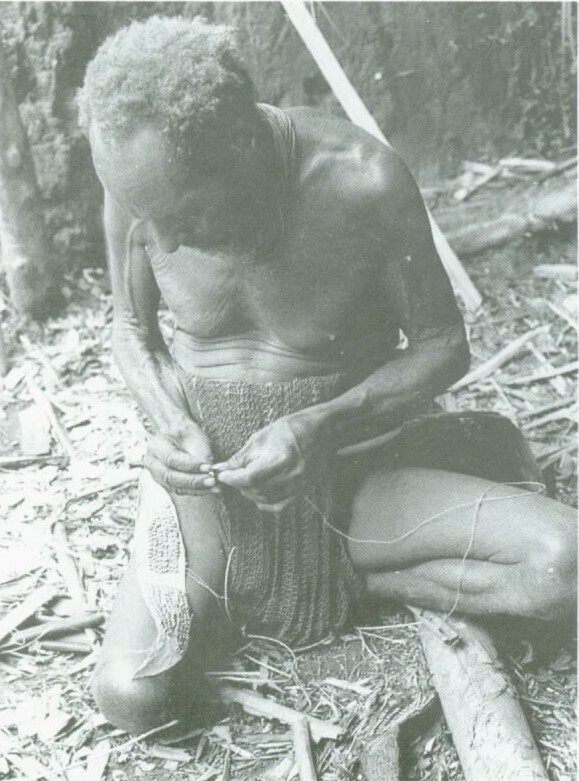 String making will have been a time-consuming occupation for any society that employed string to manufacture items of material culture or clothing. 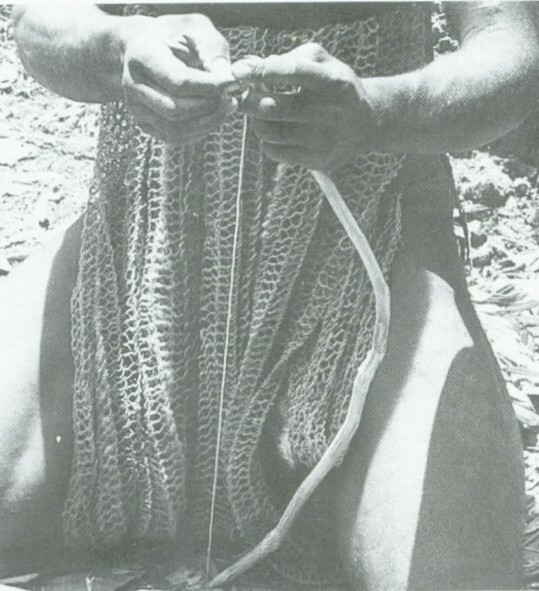 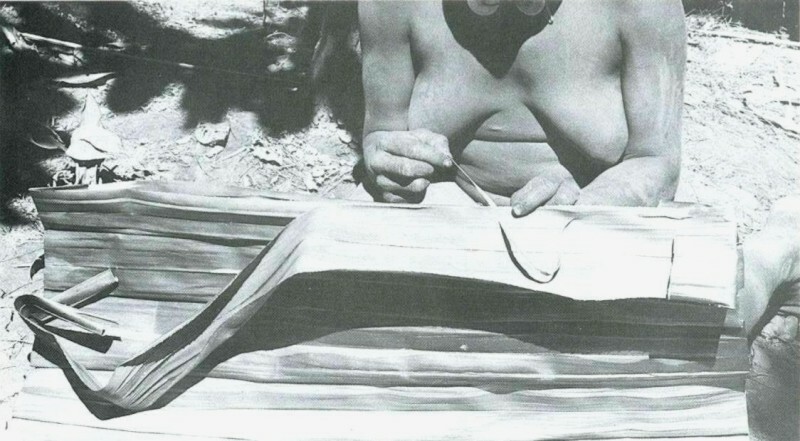 Though Sillitoe only found women string makers, MacKenzie met one male string maker while Hampton comments that both men and women rolled the fibres to twist them into string (Sillitoe 1988; MacKenzie 1991; Hampton 1999).